As the news of the Libyan rebels’ takeover of Tripoli started to spread last night, it quickly became apparent that this development was being interpreted primarily as a vindication of the interventionist camp. As the situation in Libya appeared to be heading towards a stalemate over the past few months, several voices had started to question the wisdom of NATO's military intervention there. The fickle and unprincipled nature of this circumstantial anti-interventionism was no match for the triumphalism of the other side, even before the situation on the ground was properly understood. Worryingly, this ‘success’ seems to have already energised advocates of intervention, as speculation started about where the West could intervene next. In the heat of the moment, the main argument for intervention in Libya, protecting civilian lives, was forgotten. Gaddafi’s hordes, the Viagra-and-drugs-fuelled mob that was going to butcher thousands in Benghazi, were nowhere to be seen as Tripoli fell with remarkable speed while offering very little resistance. It might sound banal to repeat that the intervention was about regime change all along, but it’s important to remember that point as the question of legitimacy surfaces in the wake of Gaddafi’s anticipated downfall. NATO had effectively interfered to tip the balance in favour of the Transitional National Council (TNC), an unaccountable entity that has a large number of former Gaddafi associates and that has behaved in a far from exemplary fashion so far. Those keen to differentiate between the intervention in Libya and those in Iraq and Afghanistan are ignoring the lessons learned there, where US financial and military support created and maintained parasitical and corrupt leaderships. While the Libyan people might still surprise us and tip the situation back in their favour, they will now have to fight against an internationally-recognised and supported clique of former Gaddafi cronies. The balance of power in this contest is already distorted by the West’s actions. Furthermore, the model of intervention practised in Libya harks back to NATO's 'good war' in Serbia and implies a departure from the mistakes of Afghanistan and Iraq. This will undoubtedly give a boost to further interventions elsewhere. The ‘no boots on the ground’ philosophy avoids fatalities among Western soldiers but it clearly highlights NATO's main contribution: its huge destructive power which is shamefully described as ‘surgical’. This revived interventionist model is even more barbaric than its predecessor, promoting the myth that real political change can be achieved through remote-controlled military aggression. The likes of Obama, Cameron and Sarkozy are seizing the opportunity to bolster their weak standing at home through this ‘success’, reviving in the process the notion that the West has the moral responsibility to intervene where it sees fit. The interventionist chatter has intensified since yesterday, with arguments such as ‘this wouldn’t have been possible without NATO intervention’. While I will personally be pleased to see Gaddafi end his despicable reign, the simple answer is we will never know now. We will also never know which shape the Libyan uprising would have taken and whether it would have allowed a different leadership untainted with its association to the old regime to emerge. In short, the right to self-determination has been taken away from the Libyan people, and that is not a small matter. Anyone still convinced of the humanitarian merit of the intervention should closely examine how the events unfolded on the ground in Libya to realise the extent to which this argument has been substantiated through exaggeration and the spreading of convenient myths. The momentum that the argument for intervention built back in March, largely due to the influence of Britain and France, was enough to overcome US reluctance even in the absence of clear Western interests. By convincing themselves that they are morally obliged to intervene, Western leaders end up acting in an irrational manner and get swept up by their own rhetoric. It is now crucial to confront the insidious logic of liberal interventionism and defend the right to self-determination. While the jubilation we might feel when Gaddafi finally departs might convince us it was ‘worth it’, the reality is it’s misguided to replace one local tyrant with the custodianship of superpowers. Let the lesson of Iraq not be forgotten. Good point, I was thinking more about Iraq and Afghanistan as precedents, but you're absolutely right. In fact, someone had suggested in March that it was a return to the 'good old' Serbia war, before Bush and Blair ruined it. 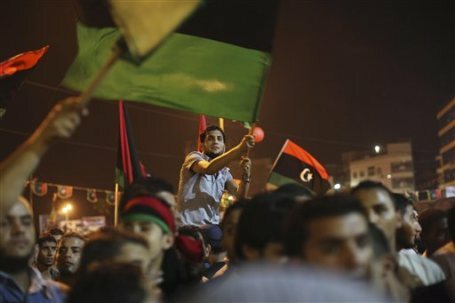 "In short, the right to self-determination has been taken away from the Libyan people, and that is not a small matter. " I never bought this, or the gross generalisation that saving Benghazi would unleash a wave of interventions. And after Benghazi, there was no turning back. Ask any Libyan then or now. Libya was not Iraq, remember?